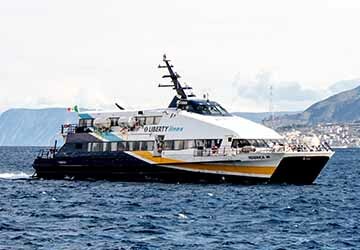 Liberty Lines, formerly known as Ustica Lines, is one of the leading Italian ferry operators. 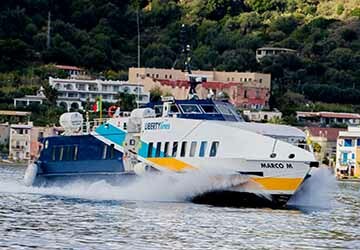 They operate ferries connecting the mainland with the Aeolian, Pelagie and Egadi archipelagos, Sicily, Ustica and Pantelleria year round, as well as Trieste and the Istria peninsula during the Summer. 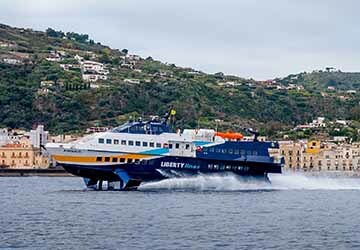 Originally offering routes between Napoli and various islands in the Tyrrhenian Sea when the company started in 1993, Liberty Lines has since grown into one of the largest operators in the country. 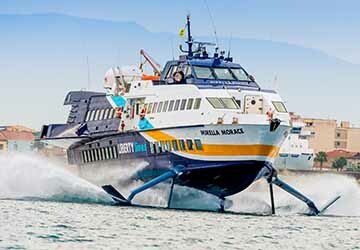 This is thanks to the introduction of over thirty high-speed hydrofoils, catamarans and monohulls which are all subject to regular safety checks, and a team of 600 crew members offering a superb quality of service to over one and a half million passengers each year. 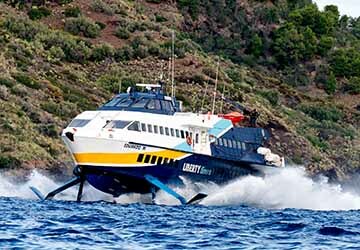 With the creation of the ‘Gianni M’, a hydrofoil capable of carrying over 350 passengers and boasting the latest technologies, they continually set the standards within the Italian ferry industry. 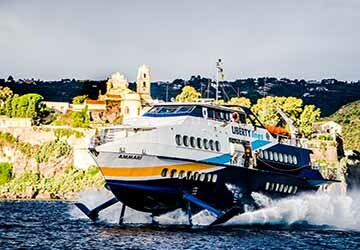 Also, each vessel in the fleet is fully air-conditioned and equipped with televisions, reclining seats and onboard bars, ensuring a fast, comfortable and enjoyable crossing every time you travel with Liberty Lines. 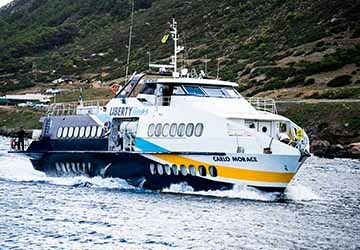 Use directferries.co.uk to find Liberty Lines Fast Ferries timetables, prices and to book Liberty Lines Fast Ferries ferry tickets. Looking for the lowest fares for your destination? 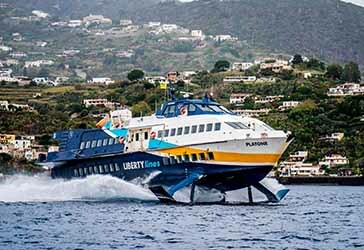 Don’t worry, we’ll also compare Liberty Lines Fast Ferries with alternative ferry companies. 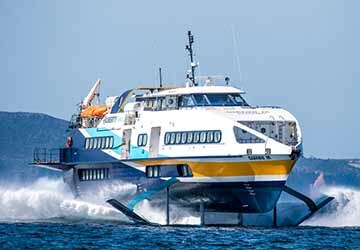 "Fast ferry, but be sure to get out at your stop in time!" The ferry was good, fast, punctual enough, spacious and comfortable. But we (and couple others) had "funny" problem. We went to lower deck and when our stop came they announced it adding "stay in your seats", so we stayed. After very short stop (no people were getting out around us) ferry went on to the next stop. Thank God that it was very near and it was the last stop, so we could come back with the same ferry rather fast. 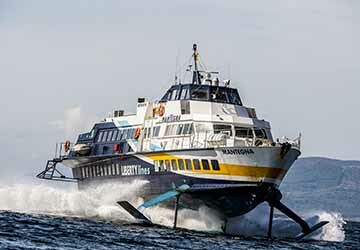 A utilitarian ferry service completely at odds with the glamour and drama of the islands it serves. If, like me, you were anticipating the time on board being a joyous and memorable part of your holiday then you're in for a disappointment. These are working ferries providing a service to locals and we tourists are just tagging along. Think Staten Island and you'll be close to the mark. But they're frequent, pretty reliable, and they get the job done with the minimum of fuss. And all the Aeolians are so beautiful you'll have completely forgotten about the ferry within moments of landing. So, the opposite of the memorable experience I was anticipating, but just as useful for all that. So get your tickets bought and see the beautiful, dreamy, wafty, Aeolians. And buy your tickets at the quayside. There's no shortage of spaces and they're much cheaper than online.